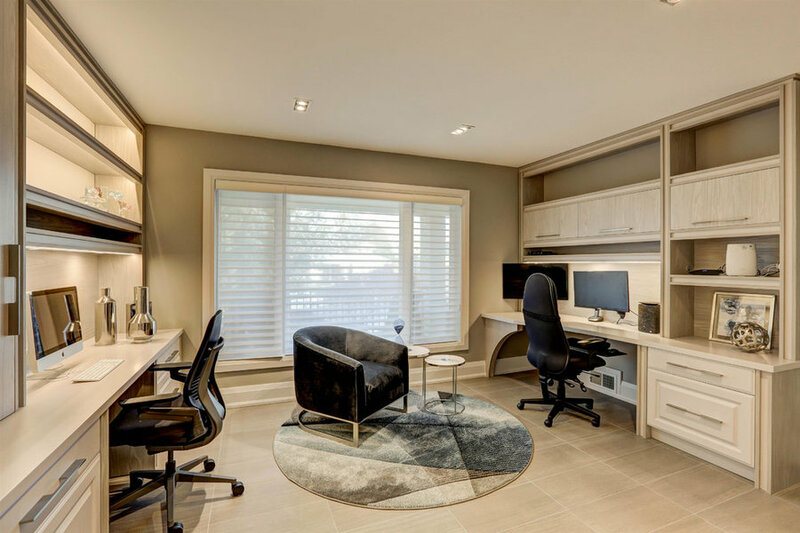 The clients, one who works from home full time and the other who works from home often but not all the time, wanted to update their office space in their large home. Wood paneling and shelving made this room feel darker and smaller than it really was, while an abundance of cables and wiring created visual clutter. 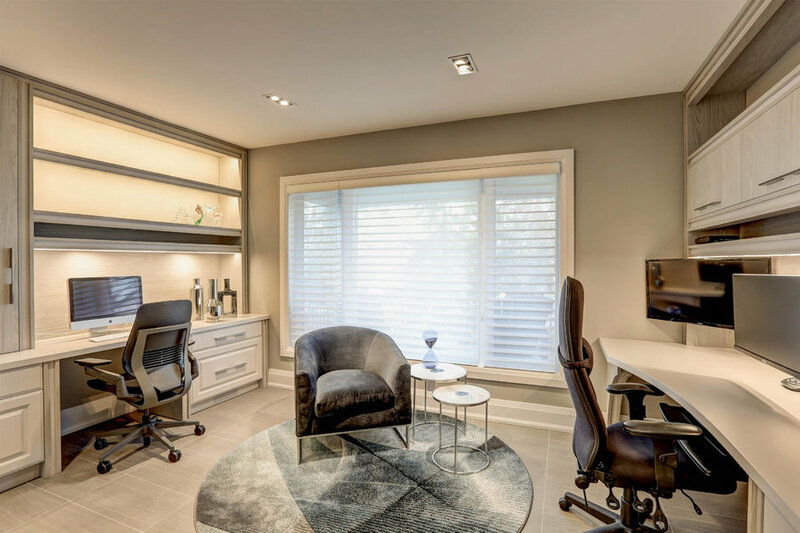 Focused on creating a wire-free, elegant home office required complex electrical and data re-wiring as well as careful planning. The adjoining powder room was also renovated. 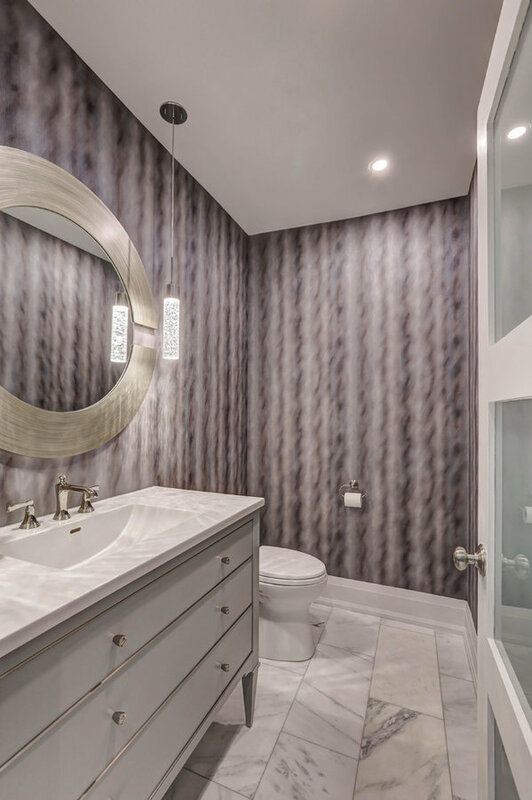 Previously a elongated room with a water closet and barrel vaulted ceiling, this bathroom has been updated to be a more efficient use of space while creating a chic and elegant powder room. The water closet has been converted to storage for the adjoining office space, foreshortening the powder room to a more comfortable size. 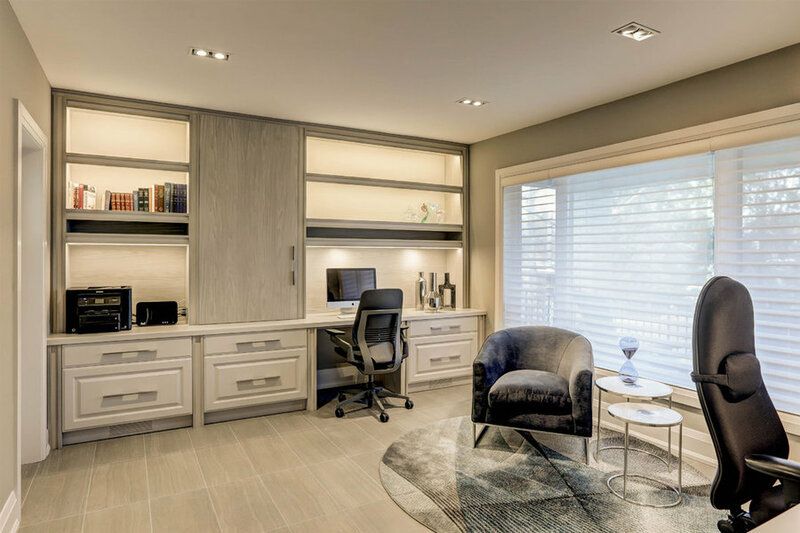 Cove lighting and a tranquil colour scheme blend to create an elegant office. 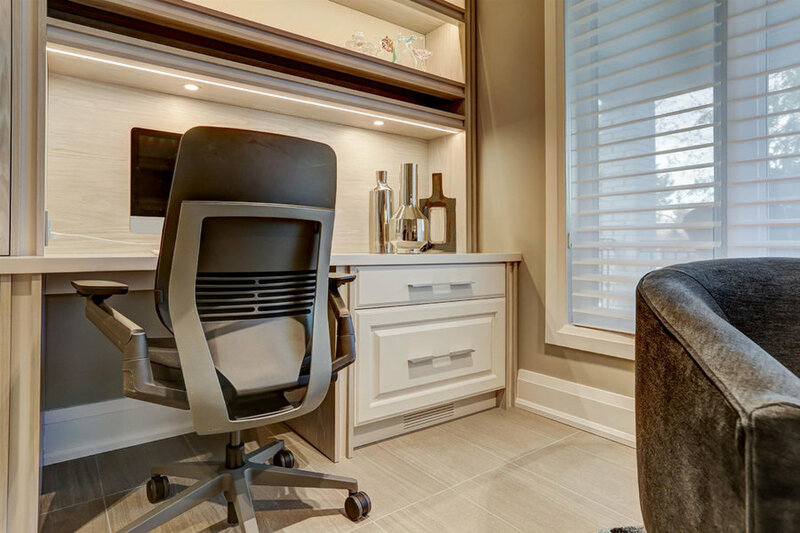 With barely a cable in sight, all electrical and data needs have been accounted for and discretely hidden from view, while still being a full functional work space. 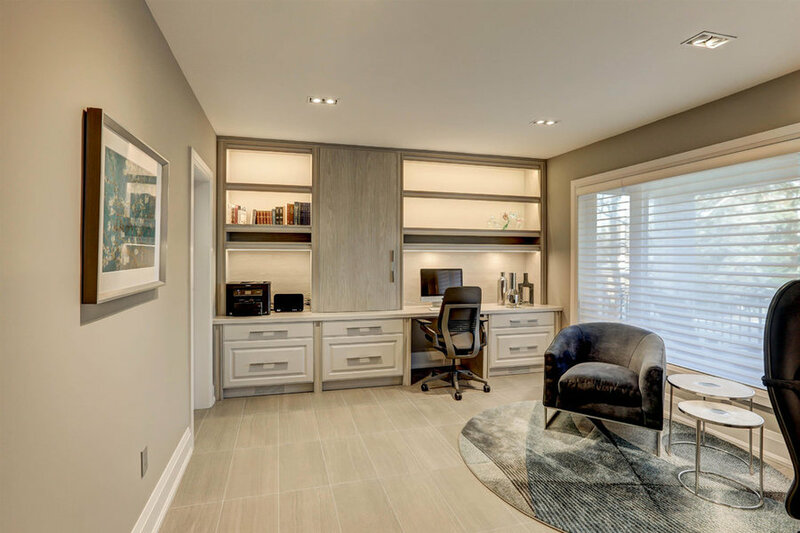 Velvet upholstery, subtle wood textures and under cabinet mounted lights lead to a comfortable space where the clients can now focus without feeling cluttered. Detailed millwork and fastidious attention to detail ensured that all cables and wires we're housed in cavities built into the gables of the custom built desks with storage. 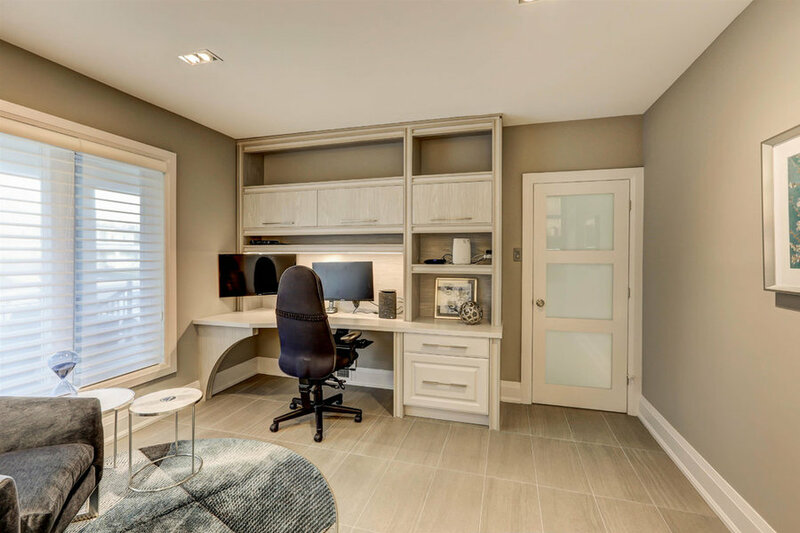 Clean, bright and functional, this home office ensures that the clients are happy to work their and proud when clients come by. Sheer blinds filter the abundant natural light, while offering privacy. By removing the valance and all the paneling, the room can now breath. 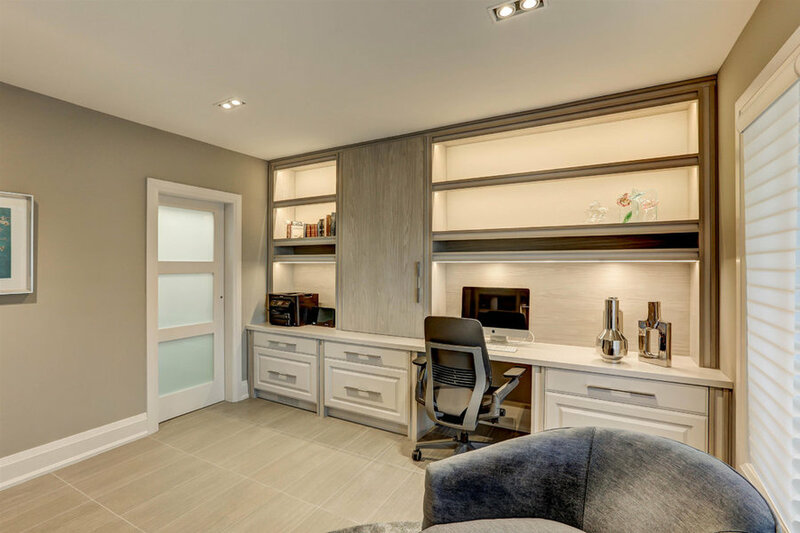 Ample storage means that everything has a place while the clients now enjoy a luminous space that allows them to focus. Adjusting pot lights enable the clients to alter what they'd like to highlight as the space evolves with their life. Brand new wall-covering introduces movement to the space while the new light fixture creates a unique dappled light effect. 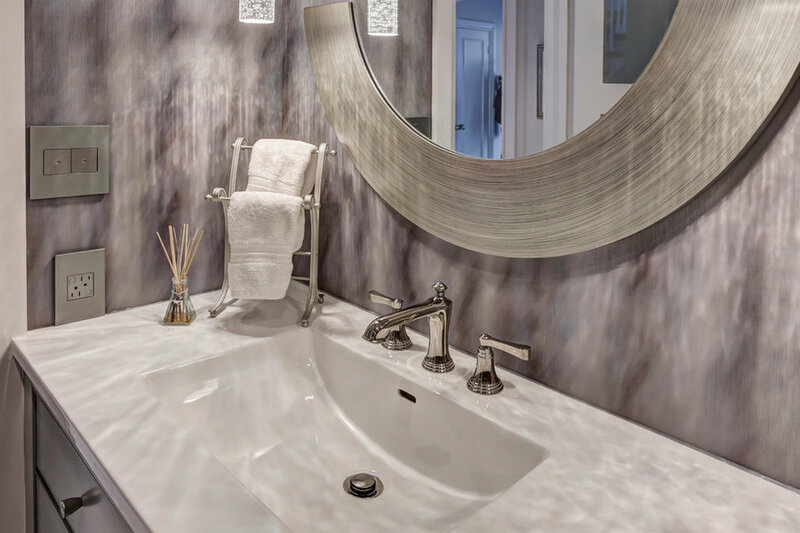 Marble tile floors with a simple but elegant vanity and textured mirror are stylish touches. The barrel vaulted ceiling has been removed and replaced with a more contemporary finished ceiling with pot lights. Floor to ceiling, this feels like a whole new room. 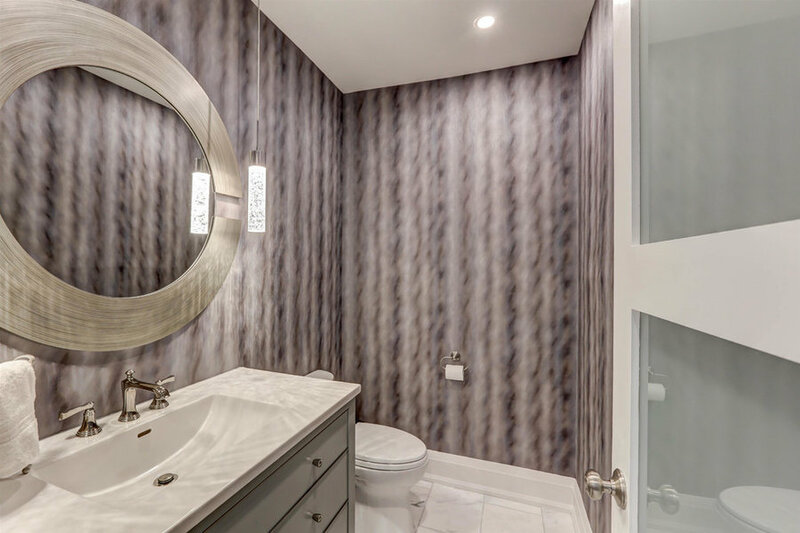 The dappled light effect from a new pedant light creates a warm and inviting glow within the powder room.